MANILA, Philippines - After Typhoon Ruby (international name: Hagupit) landfall in Samar on Saturday night, the National Government Frontline Team on Sunday, December 7, 2014 continues to coordinate with local governments in overseeing the situation and assessing damage. In a statement from Deputy Presidential Spokesperson Abigail Valte on relief operations for Typhoon Ruby, she said that this morning, the Frontline Team held a briefing during which they gave updates on the ground situation. She noted that structural damage was caused mostly by wind, not by storm surge. According to the National Disaster Risk Reduction and Management Council (NDRRMC), as of 6 am today, a total of 146,875 families have been evacuated in Regions IV-A, IV-B, V, VI, VII, VIII, and CARAGA. In a report from ABS-CBN News, Typhoon Ruby has so far claimed two lives in Iloilo as it continues to batter the province with strong winds and rains. ABS-CBN News’ Nony Basco said a 65-year-old man from Estancia and a one-year-old boy in Balasan both died due to hypothermia. The two died in evacuation centers. Initial scenes on Sunday morning have shown minimal damage in Calbayog City which is in the western section of Samar. In Tacloban City, residents said that Typhoon Ruby was not as strong as "Yolanda," which also battered the city last year. Evacuees have already begun returning home on Sunday to assess the damage to their houses as well as start the clean-up process. Reports said there's no casualties so far, and Tacloban Mayor Alfredo Romualdez says the city is better prepared this time and residents are more cooperative. Nearly 50,000 people were evacuated in Tacloban City ahead of "Ruby." "The national government continues to be on alert and is constantly monitoring both the ground situation and supply coordination efforts. As we go through this storm in the following days, let us remain calm and vigilant, and bolster our government’s efforts to disseminate accurate information," Abi Valte said. 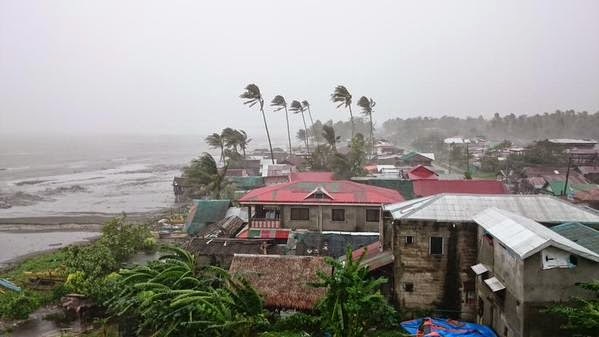 TYPHOON “RUBY” HAS MADE LANDFALL OVER CATAINGAN, MASBATE. Expected third landfall: Sibuyan Island between 8-10 PM tonight and it will be associated with strong winds, storm surge and heavy to torrential rainfall. Estimated rainfall amount is from 10 – >30 mm per hour (heavy – torrential) within the 500 km diameter of the typhoon. “RUBY” and the Northeast Monsoon will cause rough to very rough sea conditions over the seaboards of Luzon and Visayas and over the northern seaboard of Mindanao. Fisherfolks and those using small sea craft are advised not to venture out over the said seaboards. Expected to Exit PAR: Wednesday morning. Location of eye/center: At 10:00 AM today, the eye of Typhoon “RUBY” was located based on all available data including Cebu Doppler radar at 20 km East of Cataingan, Masbate (12.0°N, 124.1°E). Typhoon Ruby roared in from the Pacific Ocean and crashed into remote fishing communities of Samar island on Saturday night with wind gusts of 210 kilometres (130 miles) an hour, local weather agency Pagasa said. The wind strength made "Ruby" the most powerful storm to hit the Philippines this year, exceeding a typhoon in July that killed more than 100 people.